The newspaper is produced through the JOUR 285V Newspaper Lab course with support from student publications funds. It is published monthly, eight times a year, with a hiatus during the summer. Ka ʻOhanais available online. 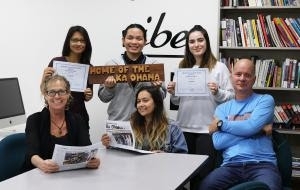 For more information about the journalism and creative media programs at Windward Community College, contact Kimberlee Bassford at 808-235-7396 or kbassfor@hawaii.edu.